You keep reading while I go make myself a sandwich. It’s no small thing when a user on your site submits her contact information on one of your opt-in forms. By taking that step, that user has become a subscriber or a lead in your sales cycle. Thank you pages are used to acknowledge that first step by expressing gratitude. Yeah, I know. But stay with me. Thank you pages go beyond good manners; they’re also used to encourage a second step in the relationship with your business. I’m talking about reinforcing the value of your brand as well as the promised offer. Really, this is about lead nurturing. You can use a thank you message. You just shouldn’t. If you’ve followed popular landing page best practices, you’ve likely removed your website site navigation from the page so users don’t get distracted from the form. Nice work! But have you thought about what happens next? Ah, you’ve used an inline thank you message. Now your user is feeling appreciated while stuck on a landing page. She has no way to get back to your site and also has zero incentive to engage with you further. Instead of continuing with the relationship, she’s going to step off your landing page and go see what’s up on Overstock.com. With a thank you page, you have an opportunity to keep the new subscriber or lead on your site by opening the door to more content. 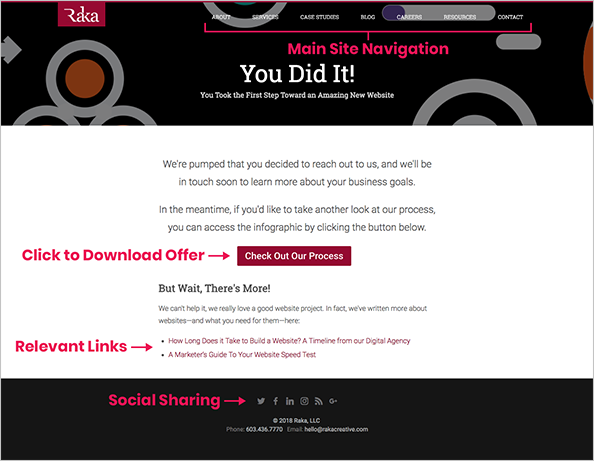 You can include links to relevant blog posts, related web pages, or even a CTA to the next offer in your sales cycle. You can also ask the user to share the offer on social media. Just by reintroducing your site’s main navigation on the thank you page you’re giving her a chance to dip her hunk of bread back into your company’s bowl of soup. See what I mean? A thank you page can do a whole lot more for your business than just say “thank you.” And in the world of marketing, your lead nurturing strategy should be just as good as your manners. A thank you page is a webpage that users are redirected to after they submit contact information to a form on a landing page.